Soak tamarind in ¼ cup of warm water and take the extract from it. Add sliced onions, green chilly and saute, till they turn light golden brown colour. Add Drum stick and vegetables, saute for 2 minutes in medium fire. Add turmeric powder, salt and water, allow to cook. Add tamarind juice and allow to boil. Add 50 gram ‘Spizly' roasted coconut paste into it and boil for a minutes. Sprinkle fenugreek powder and mix well. Remove from the fire and add curry leaves. Soak tamarind (a goozeberry size) in 2 cup of water for few minutes. Extract the tamarind juice and keep aside. Add mustard seeds and red chilly into it and allow to splutter. Add 1 large tomato (chopped) and curry leaves into the oil and saute well. When the tomato is cooked well (like a paste), add 1 tbsp “Spizly" rasam powder and tamarind juice into it. Let it boil for 2 minutes, add coriander leaves to the rasam and remove from the fire. 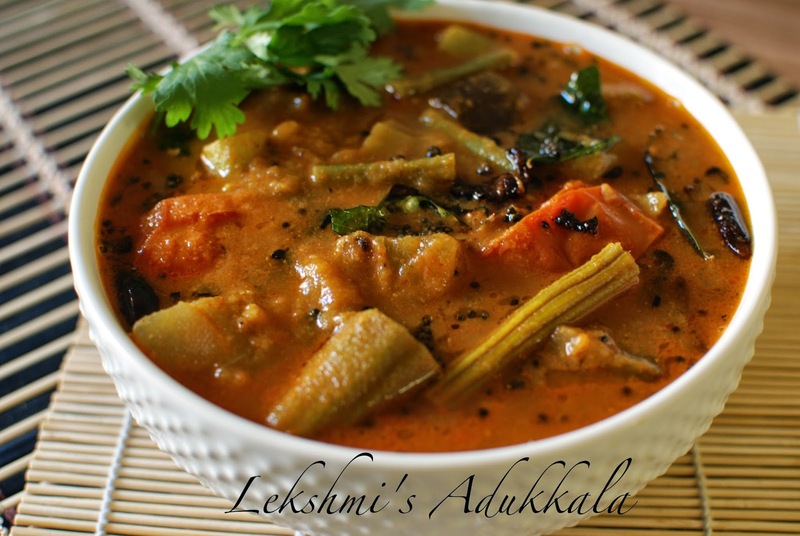 Sambar is a common in South India a dish. Common vegetables used for Sambar are potato, onion, beans, carrot, brinjal, drumstick, okra, tomato etc. Cook 1/ 4 cup toor daal along with Shallot and Green Chillies in water. When the dal is cooked well, mash it. Add 1 cup sambar vegetables along withTurmeric powder, salt and water and cook well. Once vegtables cooked well, add 1½ tbsp “spizly" sambar powder and Tamarind syrup and allow to boil. Boil the Sambar for another 2 minutes and then remove from the fire. Heat oil in a pan and allow mustard seeds and Red chilly to splutter. Add Shallot and curry leaves into the oil and fry it. Add this seasoning into sambar. 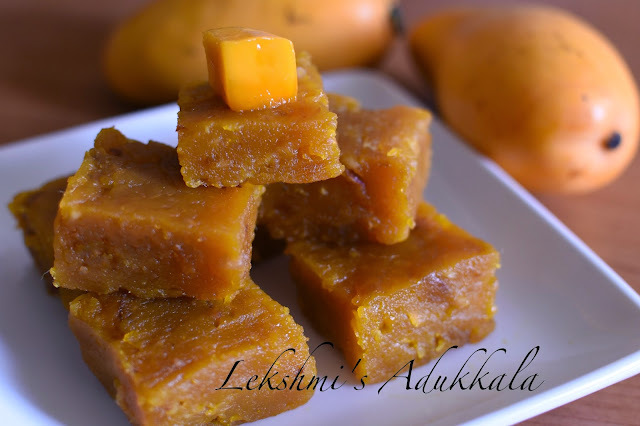 This is a simple, tasty and easy recipe of mango halwa. Dilute the corn starch with ½ cup of water and keep aside. Heat a heavy bottomed pan and add little ghee and lightly roast cashew nut and almond. Remove the roasted nuts from ghee and let it cool. Crush the nuts and keep it aside. Add the remaining ghee into the pan. Add mango pulp into it and stir continuously. Let it boil in medium heat. Add sugar into it and stir continuously for 2 minutes. Gradually add corn starch mix into it and stir continuosly (to avoid making lumps). Add cardamon powder and chopped nuts and stir well. Stir continuously for 40-45 minutes, the mixture will change the colour and reduce in quantity. When the mixture begin to come from the side of the pan, transfer it into a greased plate. Let it cool for about 2 hours and cut them into desired shape and serve. 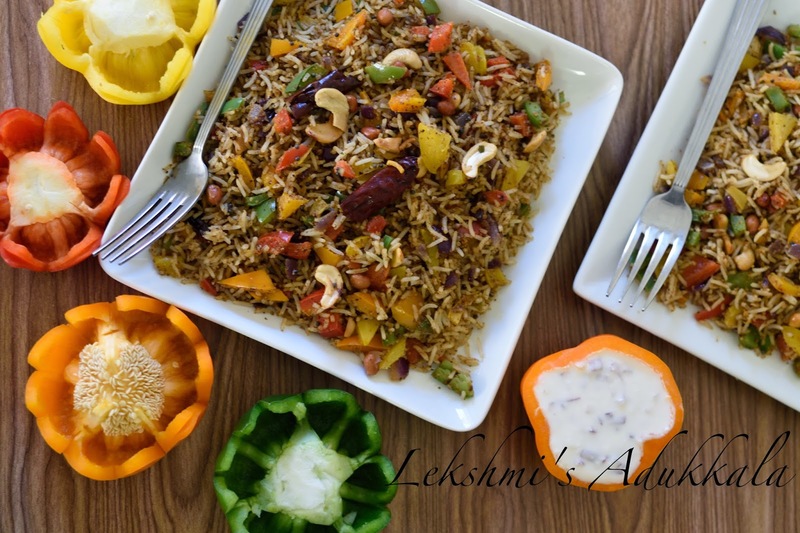 This is a simple and easy to make rice recipe that is nutritious as well as tasty. Dry roast 2 tsp peanut, cumin seed, red chilly, coriander seed, urad daal, chana daal, fennel seed, black pepper, cardamom, cloves and cinnamon. Grind all the roasted ingredients together. Heat ghee in a heavy bottomed pan. Add mustard seeds and red chilly, let it splutter. Add 1 tsp peanut and cashew nut into it and fry them. Add chopped bell pepper, turmeric powder and salt into it and saute for a minute. Add cooked rice, ground masala and salt into it and mix well. Cook for a minute, turn off the stove and serve it. Recommended Combination: Serve hot with raita. Remove seed and scoop out avacado from the skin. Cut it into small cubes. Add tomato, lemon juice, corriander leaves, pepper powder and salt and mix it well. Soak Green Peas in water for 4 hours . Cook soaked Green Peas with turmeric powder and water in a pressure cooker for 5-6 whistle. Sauté till onion turns translucent. Add chilly powder, corriander powder, garam masala,fennelseed powder and saute for a minute. Add chopped tomato and salt, saute well and cook very well in medium heat. Add cooked greanpeas and mix well. Let it cook for 3- 5 minutes, then remove from fire and serve. Add mustard seeds and red Chillies, allow to splutter. Add onions and green chillies , sauté until transparent. Add cabbage and carrot into it. Mix well, cover the pan with a lid and let it cook for 5 minutes. Add grated coconut in to it. Slow down the flame and let it cook for 2mins . Add onion, ginger, green chili and curry leaves into the batter and mix well. Add little oil in each mould of the pan. Pour batter in each mould. (3/4 portion of the mould). When one side is cooked and turns golden brown, turn and cook the other side till it turns brown colour. Remove from the mould and serve.